Daisy purrs into Nancy’s ear, ”Earth Day is April 22. Let’s make it special. We want to help children learn how to protect and preserve the Earth. Nancy comes up with a great idea. Daisy and Maisy think this is “Purrfect”. Please enjoy these lessons with our compliments. Believe it or not Homeschool Conference time is already in full swing and families are thinking about what curriculum they will be using next year. Last year at this time I had pretty much decided what we would be using, this year I haven’t had much time to think about it :-), however for those of you that are, I wanted to give you an update on the Science Curriculum we are using. My children love Science so we try to incorporate as much of it as possible into our homeschooling, they do Science as part of Classical Conversations, they also participate in a two hour Science class once a week. At home we have been using Nancy Larson Science 1. If you would like to sample some of their lessons they have preview samples available on their website. What I like about this curriculum is that it is easy to use and implement. It is well scripted and although it has specific topics in a specific order, I have found that you can skip around. In fact we have skipped topics and gone to the ones that we are currently studying about in CC. I like to be able to reinforce what they are learning or sometimes study a topic I know we will be focusing on as a preview of it. Read Yvana’s complete update here. April is curriculum review month on TheHappyHousewife.com, where they kicked the month off with this review by Marci of The Homeschool Scientist. Last year, at the 2:1 Conference, I was blessed to meet Madon from Nancy Larson Science. 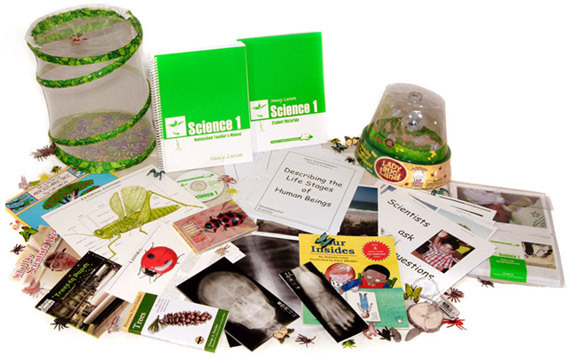 Since I had just launched The Homeschool Scientist, I was excited to learn about a science curriculum that I was unfamiliar with. Little did I know that our conversations that weekend would lead to a school year’s worth of science fun with my son! As a homeschool science blogger and science geek, I see lots of science curricula. There are plenty of great choices out there. Many have terrific content, great experiments and projects. Choosing one can be very difficult. I chose Nancy Larson Science 1 for my son because its benefits reached beyond the science content. Read the complete story at the link. Are we coming to your area? Check out our 2016 Exhibit schedule. "I love Nancy Larson's Science 3 Curriculum. It is completely self-contained. At any moment during the day, I can open up our notebooks and fire off the next lesson. Secondly, I am so relieved to have a complete script. I know that I will not miss any important facts or details. I know that I have access to all the information that I need to explain exactly what is taking place during our experiment and why the observed reaction occurs."